Mark Pincus, Zynga's CEO and creator of some of Facebook's most popular online games, believes that Facebook should take a page out of Xbox Live's book. According to Pincus, Facebook has a decision to make. Though 400 million users strong and growing, the social website is "at a crossroads. They have to decide whether it's more important to be the web's social platform, to make their social plumbing pervasive. They have a more obvious business model around being a portal." He makes the case for an "app economy," where apps are more thoroughly integrated into Facebook's current model. He also points out that, instead of bickering over new users and popularity, app makers could try to handle it like Xbox Live did, sharing a virtual space and working together to create a more cohesive and pervasive experience. Pincus encouraged Facebook to be more like Xbox Live, "where there are achievements, a consistent user experience, a way for web publishers and networks and sites to participate and an easy way for developers to develop amazing game experiences that enhance relationships among people." The result would be a Facebook where apps become the main focus of social interaction. "It would bother me if (something as innovative as the location-based Twitter game) Foursquare was not built on the Facebook platform," Pincus explains. "An analogy is Windows. If it had not been the home of Excel or the web browser, then it would not have grown." Pincus argued for three important tools if Facebook should choose to follow this route. One is an "app bar" that would follow the users to every page, providing them with an easy way to get back to their games. The second would be better user communication, which would allow apps to reach out to their users without being obtrusive and annoying (say goodbye to those annoying "I found a lost stallion" status updates), and finally, universal social feeds that would be accessible from anywhere on the web. Though I would thoroughly welcome a less obnoxious way for game apps to communicate with their users beyond clogging up the status updates feed, I think Pincus is somewhat missing the point. Facebook is first and foremost a social application, and although gaming fits very neatly into that category, it's not meant to be the website's focus. 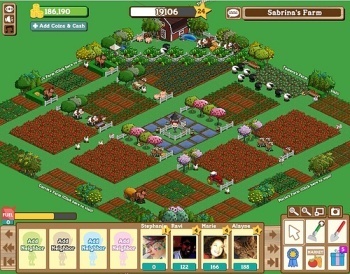 Could Pincus be hoping to tweak Facebook to better suit Zynga's interests?